The state’s highest mountain, in Carson National Forest, reaches 13,161 feet. 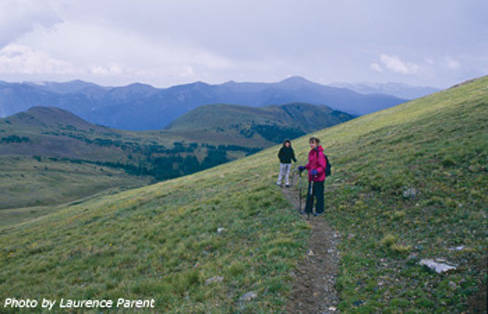 Start early from the trailhead at Taos Ski Valley, and as you wind your way through alpine tundra vegetation you might encounter marmots, pikas, elk, mule deer, and golden eagles. Although the spring thaw means you likely won’t need snowshoes, it’s wise to be prepared with MicroSpikes or YakTrax. A paved path leads to the foot of this 130-foot waterfall 43 miles west of Carlsbad. Arrive in the morning, when the sun illuminates the swimming pools below the falls, then continue up the trail to the area above the falls, on your way to Sitting Bull Spring. You’ll find many wildflowers and aquatic plants here during the summer. Just beyond the spring, perch on the canyon rim for a spectacular panorama of the Lincoln National Forest. and primitive mammals, reptiles, and dinosaurs. Today the wetland has been preserved as a desert wilderness. Pleasant temperatures make this time of year suitable for exploring this exposed landscape. You won’t find designated trails, but you can follow the well-worn flat areas surrounding the washes. Start at the Panchuela campground in the Pecos Wilderness. From the trailhead, you’ll hike alongside the Panchuela and Cave creeks. The gentle incline is lined with wildflowers and thick vegetation in summer. The water eventually disappears into a series of caves—and so will you, if you’re not careful. The caves are cold, wet, and slippery; come prepared with a headlamp, warm clothes, and practical shoes. If you’re in for more than a day hike, this two- to three-day excursion culminates at a remote mountaintop fire lookout in the heart of the remote Gila Wilderness (during the summer, a Forest Service ranger is stationed here). To summit, you’ll follow Trail 182, starting at Sandy Point, along the crest of the Mogollon Range, the highest mountains in southern New Mexico. Just before reaching the peak, you’ll trade the dense forest for stunning views of southern New Mexico and Arizona.